so you keep the cork, of course. But over time you've save a few dozen of these corks, in a bag, in a draw... wherever... and you can't identify them any longer. 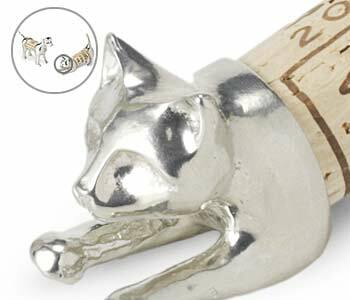 The Cork Pets may help to remind you by adding a sparkling pewter personality to the cork and reinforcing why it was so special. Hand sculpted from wax, before their pewter casting, each 3.5 inch Cork Pet is polished to a high finish to give your cork the attention it deserves. The Cork Pet makes a wonderful gift. You man want to save your cork this Valentine's Day and give it back to your special one in a Cork Pet from Uncommon Goods.